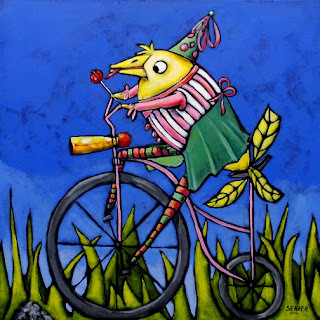 There are times when one shouldn't do two things at once: chop onions and talk on the phone, walk and chew gum (at least for some of us) and ride and eat a lollipop. Disaster often follows. The story I lay down here is true to life, out of the annals of our family history. It has nothing to do with doing two things at once, or the dangers of transportation of any kind, but it does involve lollipops. One Christmas, the assembled family (enough for two cars of folk) planned to head north to visit MORE family. Now some of you might say, "There's your first mistake." But, truly, we went to see perfectly ordinary people whom we hadn't seen in a while. Just as we were mounting up, men and boys in one car and women in the other, my younger son said to me, "I have a bubble in my throat." UH OH. The only other time he'd said that to me, there was barfing in our future. Feeling sly, I said, "Oh, Sweetheart, don't you want to ride in the car with your brother and all the other guys?" "No, Mama, I want to ride with YOU!" We were in for it. About 20 miles up the road, I unwrapped one of my favorite candies, the one the Tootsie POP people only make at Christmas. A peppermint Tootsie POP. Yum! At that moment, tragedy struck. Yup, barfing. Why didn't I think to grab towels, an empty bucket or, indeed, any manner of barf receptacle before leaving home? Obviously I had been hoping that there would be no barfing. I stuck the lollipop in my mouth, grabbed my son's new knitted hat he'd gotten as a Christmas present and held it under his chin. Now, knitted hats are warm and fuzzy and perfect for when the cold wind blows, but they do not hold liquid well. Using my elbow, I pushed the button to roll down my window and hurled (pun intended) that steaming hat as far as I could out onto the grassy easement of I-95. The other driver in our party, realizing that there was some distress in our car, had pulled over just in front of us. I got out of the car, lollipop in mouth, and went to tell the fellas we were turning around and would see them later. The whole experience left me with only one thought, really. Why does crisis occur every time you have a sucker in your mouth? It makes one feel so silly. Did I give up lollipops? No. Did I stop going north to see family? No, but I started carrying around an appropriate container for vomit, and I learned to pay attention when I heard, "I have a bubble in my throat." We purchased another winter hat. Eschewing all transportation producing waste, either into the air, or in great steaming plops in the middle of the road, Lord Spencer sallies forth on his bicycle to check on his tenants, the Moles. He is conscious to wear clothing which will at once be suitable for riding out on a cool, crisp day, and proper attire for a bird of his station in life. One must show respect for oneself, after all, as well as for those on whom one calls. And the poor Mole family has been beset by all manner of ills. Henry is recovering from having tripped over his own mole hill and spraining his ankle; he is woefully behind at work. His wife, Martha, is expecting a blessed event at any moment. Worst of all, their parents' indisposition is causing the older children to run amok. Just the day before, Lord Spencer himself caught Essie in his stables, letting the air out of the tires of all his best mounts. His groom threatens to quit on account of it. Petie, after repeated corrections, continues to dig random tunnels, hoping to join his burrow to his best friend Ronald's burrow, causing the entire field to look like it has been plowed by a drunken farm hand. Lord Spencer remains sanguine, ever the practical landowner. "Moles are nothing if not great aerators." That happens to us all, doesn't it? 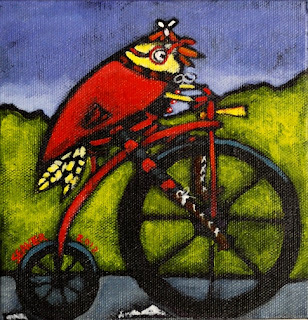 Life sails along, comfortable, relatively easy, and then, a speed bump appears in our path, knocking our front wheel up into the air, leaving us vulnerable to losing our hats and landing ignominiously on our tail feathers. Landing, legs splayed, rear muddied, bike in the ditch can be viewed as an absolute tragedy. Or, perhaps as we are picking ourselves up and dusting ourselves off, we can think about things. Oh, things like, am I on the right road? Is it time for a change? Perhaps one needs to don a helmet for safety, or one had such fun falling in the dirt it births a realization that life has become TOO safe. I wish for you all that you take that journey/path/fall with the love and support of good friends around you. Ones who, once they have ascertained that you only got a bruise on your pride, may hoot and howl at your dusty form in the middle of the road, but will stick around to pick you up and make sure you are truly okay. I have such friends. Thanks to you all. What would I do without you? Melba and Bartholomew had been good all week. Not because they were naturally well-behaved, docile birds, but an enticing motivator for best behavior had been offered by their teacher, Ms. Betterfeather. She announced her plan on the Monday before the circus was to be in town. With some difficulty she got the attention of the twittering group. "Behave well for a week," Ms. Betterfeather promised, "And you will receive a ticket to the circus." Well, Melba and Bartholomew fell for the bribe, hook, line and sinker. And although neither of them had behaved well through an entire day before, much less a whole week, they knew they could do it. They must do it. They chattered all the way home from school every day. They chirped and tweeted as they visited each other's nests. Finally, their mothers put wings over ears and pushed them out on the ground to play with the dress up box. Here was magic! One couldn't go to the circus in one's every day clothes, could one? That would never do. Well, you know what happened. Ms. Betterfeather enjoyed a blissful week in the classroom, at least where Melba and Bartholomew were concerned. And the jester and the king were granted permission to race their bicycles to the circus for the Saturday matinée.